These direct actuating valves provide extremely fast response times for accurate dosing of minute volumes. Their subminiature size makes them ideal for transportable/mobile systems. • Expected life of over 1 billion cycles! Like the 8 mm, these 7 mm subminiature electronic valves provide extremely fast response times in combination with the same long life as Clippard's trusted EV Series. Offered in both Normally-Open or Normally-Closed models, these 2-way and 3-way valves are perfect for small areas where compact electronically-controlled pneumatics are needed. These 3-Way Normally-Closed electronic valves feature a low-power DC solenoid and can be directly converted to high pressure pneumatic power without electronic amplification. 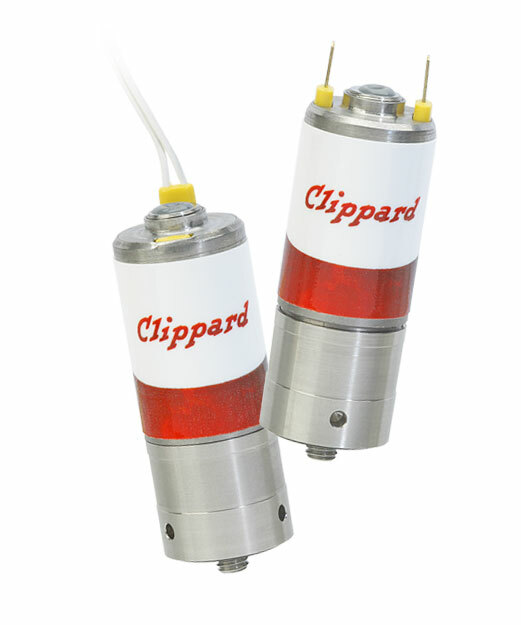 Designed as the next generation of Clippard's well-known and trusted EV Series, the powerful DV Series is compact, quick and built to last—over 1,000,000,000+ cycles! With a solid, compact design and extremely high flow rates, these valves are well-suited for many applications in a wide variety of different industries including medical, analytical, packaging, manufacturing and more. 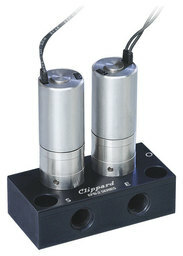 Clippard's next-generation DV Series valve is now available in a 2-Way proportional control version! The new DVP Series provides a high degree of control and customization. Available in manifold mount or #10-32 mounting styles, the DVP provides fast response times and exceptionally long life. These electronic fill and bleed circuits are a combination of Clippard pneumatic valve components that can be used to inflate a volume or apparatus in one controllable function, and to release or vent pressure in a second controllable function. At just over 1" tall and less than 3/4" in diameter, EM Series valves are ideal for applications where space is critical. These valves feature the same reliable, proven design as the EV Series housed in a miniature body. Perfect for air and/or gas control, pilot control, and any application where space is limited but desired performance is not. ES Series valves convert low voltage, low current signals into high pressure pneumatic outputs. A compact, geometric design make these valves well suited for a wide range of applications in environmental test equipment, textile machines, packaging machinery, computerized industrial automation, portable systems and many types of biomedical applications. • Overall height less than 1"
These are essentially hybrid valves consisting of a Modular Air Pilot Valve and an EV Series electronic/pneumatic valve. The EV valve responds to low current, low voltage signals and pneumatically actuates the Modular valve it is attached to. Quiet and quick, these precision-built 2-Way and 3-Way control valves feature a unique patented valving principle with only one moving part. Extremely reliable—proven to over 1,000,000,000+ cycles! Analytical Series, Oxygen Clean Series & Corrosion-Resistant Series also available. EVP Proportional Control Valves combine the features of the EV Series with the additional capability for proportional control. The EVP Series provides air or gas flow control and varies the output based on the current input to the solenoid. Consistent gain provides a high degree of control for many applications. These electronic valves offer high flow in a small package. Constructed of aluminum, stainless steel and thermoplastic materials. Available as body ported, manifold mount and actuator (1/4" NPT only) mounting. Standard models include a base that permits fast, secure mounting of electronic valves to a manifold for grouping in compact assemblies. Utilizing the industry's most robust and powerful linear actuator, the high flow SCPV Series stepper-controlled proportional valves outperform the competition in performance and durability. Ideal for critical applications such as gas delivery, medical, analytical and industrial automation requiring high resolution, high flow and low hysteresis. Did you know? 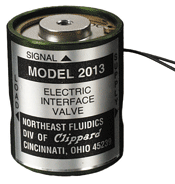 Customized products make up nearly 50% of Clippard's electronic valve production! From simple tweaks to complex challenges, Clippard is a leader in manufacturing special products for a broad spectrum of industries.